can remove foreign material such as roll-offs, heat treat and plating debris, and mixed parts which don't have the same head diameter as the subject part, in the case of screws, or thickness, in the case of washers or nuts. can sort shank length, presence of threads, head diameter, and foreign material. A sort for these four parameters constitutes the basic "100 % sort"�, or "sort for automation"�, and is sometimes incorrectly referred to as "laser sort. "� Missing washers, double washers, mixed sizes, head height, and in some cases, hex size, can also be sorted. can sort recess depth within .005"�, and recess flaws due to broken punches or plating fill using special accessory equipment (Phillips, Torx and Posi). 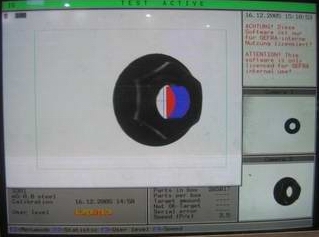 Slotted & Hex drive presence and depth can be verified with a "Pin"� sort. can sort shank length or major diameter* within .003", threads on both ends of a double ended stud, partial threads, thread run-ups (drunken threads) sliders, and thread damage affecting a minimum of 180 degrees of the part diameter. Can also sort mixed point types, groove diameters, and internal lengths. (Same as above) with added feature of sorting for cracked heads (must be a burst/open crack, cannot detect diagonal cracks), excess flange, ballcaps, concentricity issues, flowering & out of round heads. can sort for cracked heads on parts with a minimum size of M6 x 18mm with round heads (pan, truss binder, round etc. ): a Phillips, Torx, or Posi drive configuration. Needed for hairline cracks on safety items. will sort parts of 5/8"� minimum length for overall length, body diameter, presence of threads & foreign material. can sort for multiple diameters, presence of threads / partial threads, component lengths, overall length, & foreign material. Can sort the parts for damage and other characteristics approximately 360 degrees around the part. can sort nuts for ID, thickness/height, burrs, OD on round and flange nuts, width across corners and flats on square and hex nuts, presence of threads, nylon ring, & foreign material. Can sort washers for ID, OD, flatness, thickness, clipped, and foreign material. *Accuracy of diameter sorts is affected by out-of-round condition. The more perfectly round the diameter, the more accurate the sort.